Tom's work is influenced with a deep respect for the furniture craftsmen of the 17th and 18th centuries. Their knowledge of form, balance, joinery and of wood movement is evident in the pieces of fine furniture that still exist today. He relies on shared expertise of those craftsmen from long ago and those of today, who continue to up hold a quality of excellence in creating traditional fine furniture of heirloom distinction. He unashamedly admits that the traditional masters of my medium, such as Thomas Moser, Garrett Hack and Chris Beckvoort influenced him. He uses only solid hardwoods throughout each piece, always reading each board’s grain pattern and figure to determine its best use in creating an attractive and functional piece of quality furniture. The Shakers have had a profound influence on Tom's work: their clean unadorned simplicity, functionalism and craftsmanship. 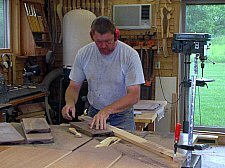 Whether building an exact reproduction or drawing inspiration for my own designs, he keeps the basic Shaker tenets in mind. Tom's pieces are intended to harmonize with your environment. 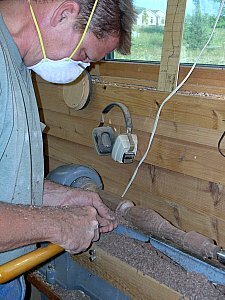 He uses native, sustainably harvested solid wood species. In the long run and most important, a well-designed, well-built piece of furniture that lasts 100 years is always preferable to one that can be bought at one quarter the price but must be replaced every ten years. Certainly his prices can't compete with mass produced, factory-made furniture. Production shops deal with the average needs of the average consumer. He constructs each piece individually, taking as much time as he needs to achieve perfection. Upon purchase, he signs and date each piece. 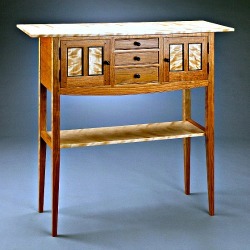 Tom's clients value the beauty of solid wood and appreciate things finely constructed. After all these years, Tom still works alone. Each piece is designed, laid out, glued up, sanded, constructed and finished by Tom.